Missed last weeks post. I was trying to figure out the best way to transfer pictures from my hubby's computer to mine-without losing any of them! In any case, here is what I finished before I started working on Christmas! Around this time last year, I went and bought a whole new wardrobe in anticipation of being hired to the new job (it will be a year the end of February, hooray). In any case, most of what I bought was for cooler weather, so I needed some tops for warm weather. So, I bought some patterns (at a JoAnn's sale for $1.00 each) and made these. These are just overtops so I could wear something cooler underneath. I still get hot flashes! I particularly like this one. It is a pale lavender. The next picture shows the little pleating detail in the front. A pullover to be worn alone. This top is actually a size too small but there is enough give that I can still wear it. It is black. This one was made from the same pattern as above but I only got one wearing out of it. The weave was so open there was little for the stitching to hold onto and there wasn't enough give. The shoulder seam pulled out the first time I wore it. If I make this type again, I will have to use twill tape to give something for the stitching to hold. A little dress for Autumn. I had the fabric, the lace and the pattern. It was just begging to be made. Here is a picture of Summer Breezes on my Aunt's bed. She has a room in an assisted living facility. All the other ladies there are jealous, LOL! That's it for this post. Next post I will show you some of what I made for Christmas presents! In keeping with my resolve to post at least once a week, this time I would like to offer some (very) belated thank you's. About two years ago, Joann asked me to help her daughter, Laura, with a "Flat Stanley" school project. For those of you who haven't heard about "Flat Stanley", it is a little paper person drawn and colored by the student and sent to spend a week with someone to see where they live and how they spend their time. Laura sent me Ki-Ki! Ki-Ki and I had a lot of fun that week (I wasn't working then) and I sent her back with a lot of pictures and an email diary of our adventures. Laura, I understand, got an A for the assignment. In appreciation, Laura made and wrote a lovely handmade thank you card and Joann sent me some goodies! Five fat quarters, a scissor fob, a card and, of course, Laura's handmade thank you note! publishing in a post. Then I put the envelope away so I wouldn't lose it! Do I have to spell this out? I didn't lose the envelope, I lost where I put it! I found it after Christmas when I pulled my sewing room apart while cleaning up and reorganizing. So, Joann and Laura, my heartfelt thank you for the lovely gifts even though the pleasure of working with Ki-Ki was all mine! I think it was back in September/November when Ruth blogged about making premie burial nightgowns out of a lovely white fabric with pink roses. I asked her to send me the pattern as I have a lovely white fabric with yellow roses that would be perfect for these items. Along with the pattern, Ruth sent me these goodies. A Christmas ornament, tissue holder and a pretty card. Thank you, Ruth! I love them. The Christmas ornament is just the right size to hold my rotary cutter. It makes me smile everytime I work in my sewing room! A total surprise at Christmas! Received this package from Katie and was so surprised! 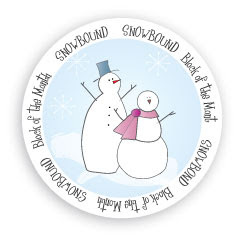 Isn't this little snowman just too cute! I didn't realize Katie had made this until I saw her post them on her blog. Katie, thank you so much for thinking of me. He has been given a place of honor on a shelf in my sewing room. No way I was gonna pack him away! And now something that will either make you laugh or groan! Back when we were swapping our APQ Blogging Buddies blocks, Ruth included this in the package with her blocks. This is (I assume) the front side. Pretty, isn't it? However, me, being the airhead I sometimes am, couldn't figure out what it was! I have since found out it is supposed to be a Christmas ornament! Ruth, this is no reflection on you, believe me. But, despite the fact I didn't have a clue, I put it to good use. This is what the back looks like! Tried to write a new post but blogger is not behaving. Seems I can't upload new pictures from a file on my computer but it will let me post pictures already uploaded to the blog. Until I can figure it out, I am going to concentrate on filling up my new pages. 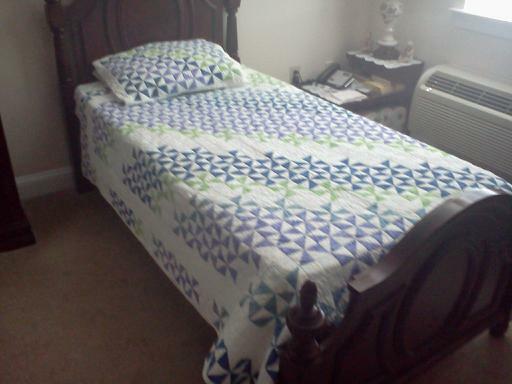 That being said, I've uploaded a number of pictures of completed quilts. Hope you enjoy them. Just click on the tab above. Hello all my blogging buddies! Hope the New Year finds you and yours happy and healthy and with ENOUGH. Enough food, enough sleep, enough love! I think you get the picture. Wouldn't life be so much simpler if everybody was happy with enough? So, a new year and a new start, hopefully. As you can see, I have been working on the blog just a bit. Changed the layout so there are three columns now (which will let me have bigger pictures, too). Added a bunch of pages at the top. Sorry, there are no pictures yet. These will take a while to find, upload and tag. Much of it you will have seen before, but now they will all be in one place. All I have to do now is figure out how to expand my header picture. Let's see how long it takes me to figure that one out, LOL! I have alot to show you since my last post in September. Many finishes, new stuff and some quilts. My little "one hour of sewing" every morning before work is really paying off. It really amazes me how much I have been able to accomplish! If all goes well, I will try to post at least once a week. No, this is not a resolution just a "let's try it and see" thing. Sometimes I am so intent on getting things done that I forget to take pictures or I take the pictures and never get around to posting. But I am gonna try! So, here's to a New Year! HAPPY NEW YEAR 2013! Hi, Everyone! I have to tell you that I met the sweetest person last Saturday. Ruth of Country Log Cabin. She and her husband, DH (and yes, that's what I call/ed him) were traveling up the New Jersey turnpike on their way to visit family in New York. With a little juggling, we agreed to meet at the James Fenimore Cooper rest stop on the Jersey turnpike. I was so excited! Then Ruth says, "Bring some of your projects, I would love to see them!" The panic set in. What should I bring? Quickly cleaned out the car (I don't always bring everything in from my shopping trips, LOL) and started loading stuff. By the time I was done, the whole back seat was covered and I wasn't sure I had brought enough! I got to the rest stop early. Ruth said they were driving a red truck with a white 5 wheel trailer. I watched and watched and suddenly, there they were (kinda hard to miss). Her vehicle was the only trailer hauled into the rest stop the whole time I was there! There was no mistaking it! After our initial meeting (I couldn't stop grinning), Ruth and I spent some time at my car looking over my stuff. I had so much, LOL! Then we went to her trailer. I can't tell you how marvelous it is. So compact yet so much room! And she has a whole little quilting area all mapped out - sewing machine, cutting table and all! One of her quilts graces the bed and it is absolutely gorgeous! Then there are the other little touches, her own table runner, Love's Texas wall hanging, her grandchildren's artwork and the little stitchery of Texas bluebonnets I sent her! A true home away from home. DH, Ruth and I had lunch and gabbed about all sorts of things. All too soon the time was gone. So we took a couple of pictures and said our goodbyes! Ruth, I can't thank you enough for this opportunity. It was the highlight of my Labor Day weekend! And, to all my other blogging buddies out there, if you are ever in my vicinity, let me know! Hello! Lovely to see you again! Thank you so much for all your wonderful comments and warm welcome back. I must confess though, that I am much like Ruth. Four AM seems to be wake up time for me. The eyes just pop open, LOL! And, like Ruth, I am also ready for bed around 9:00 PM. I think it may have something to do with the season and body rhythms. It also seems that I don't need as much sleep as I used to-or something like that. I promised you more pictures of completed projects, so here goes. Do you remember this bag? Something I picked up at a flea market that was originally a JoAnne's kit? Well, I liked it so much, I kept the pattern and directions and reapplied them. If you remember, many years ago all the fabric shops were selling printed pillow panels for 14 inch pillows. They were so pretty and I, of course, picked up quite a few of them when I found them on sale. Couldn't resist, you know? (Of course you do, LOL!) Since I am not really a throw pillow type, the panels went into my stash until I could find an alternative use for them. This little bag pattern was the perfect alternative use. Here's what I made. The front and back on the first one were different. I sandwiched the panels and quilted along the lines of the design to give it depth and texture. I don't think it showed up well in the photos though. This is a view of the side. There was enough of the design to cut the bottom and sides. Worked out quite nicely. Here is another. Both sides were the same on this one and the next.. I still have some panels left but no fabric that will work for the linings yet. (Yes, the bags are fully lined inside.) The actual size depends on the size of the front panels, but the side panels are cut at 4-1/2 inches wide. If anyone is interested, I would be more than happy to share the pattern and instructions with you. Once you get the hang of putting these little bags together, you can adjust the directions to just about any size you wish. They were fun to make and I will use them as gifts, IF I can bear to part with them, LOL. Yes, still here, just not HERE! Things have been a little tough since going back to work. The adjustment has been a bit difficult because as much as I already knew what I was doing, I did not anticipate all the writing. This company wants everything put down on paper and it has been exhausting. Sometimes, once I get home, all I can manage is dinner. All the summer heat doesn't help either 'cause I don't handle heat and humidity well. It drains my energy. Much of my time has been spent trying to figure out how to work in some machine time. I never stopped the handwork, but that has slowed too. It is hard to stitch when your eyes are closing of their own accord, LOL. But I have solved this little dilemma and quite simply. I just get up an hour earlier for work-at 4:00 instead of 5:00. I am really at my best in the morning. I am usually ready to leave my house at 6:00 (breakfasted, dressed, etc. ), so I spend the last hour sewing. One hour every morning equals 5 hours by Friday. Saturday and Sunday are spent in finishing and preparation for the next week. Don't know why I didn't figure this out earlier! It's been working out really well! So, here are some finishes. I have alot of pictures of handwork and other sewing projects so I will have to split this post up. So, let's start with the handwork. I am sure you remember this one. Started it in one corner many years ago and it is finally finshed. I have a number of other large crewel projects to finish but will probably not start on any more until the weather cools because they are worked in wool thread. It measures 20" by 18". This next one was picked up at a flea market. It was about 3/4 done and all the threads and instructions were with it. It is a Jacobean design, a favored subject for me. The kit was for a 14 x14 pillow so it will fit in with the other pillow tops I have. Here is a really tiny one worked in thread. It measures 6"x5". The colors and stitches were my choice. I don't know if you remember the Poodle transfers but I finally got those finished. 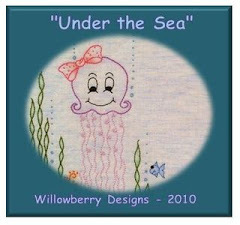 They are intended for a purple/pink quilt for my niece's little girl. I think they turned out rather cute and I see them as pictures in a frame. I am still mulling over the settings. Ok, so that finishes up the handwork. Next post I will show you a few smaller sewing projects. I've been married for over 40 years (yes, to the same man) and have 3 wonderful kids (all grown up now) and five delicious grandchildren. My mother taught me to use her sewing machine at 6 years old and in quick succession she taught me embroidery (love it, hate needlepoint); knitting & crocheting (which I also can't stand). I started quilting a few years ago (self-taught - everything I read made it sound difficult). I tend to collect things that interest me - fabric, transfers, plants, books, earrings, decorated candy tins - did I mention fabric? Self-confessed Fabric Hound here. Hope you enjoy your visit! For pictures see Completed Quilts Tab above. 15 Minutes Play - BumbleBeans, Inc.